We are so happy it's Thursday. Not only is it the eve of Friday, but it's also a day full of fun and thanksgiving. First up, we have the Thoroughly Poetic Thursday challenge, hosted by Angel Sammy and Teddy. This week brings us to the penultimate letter of the alphabet. That is, the letter Y. So, who do we have for you to meet today? Stretching makes your muscles fray? You really must seek the help of good sir Yang. For yoga is his greatest sport. Like the mountain, the boat, and even the bear. And he even might make you look like a frog. Yang the Yoga Instructor is the one you should fetch. Even when he's posing like a tree. As always, our poem today was inspired by a real life Yang. To visit him, just lick there on his name! And, of course, here is a little doodle we created for Yang the Yoga Instructor. 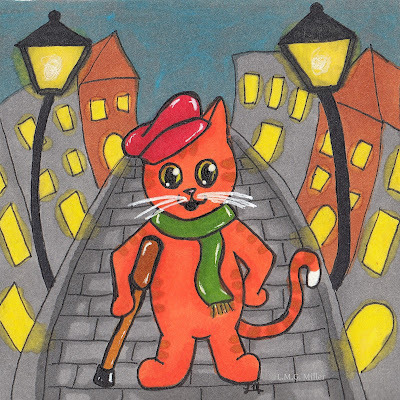 Today we were going to share another doodle in our Tails of Tiny Tim series, which honors specially abled furbabies. 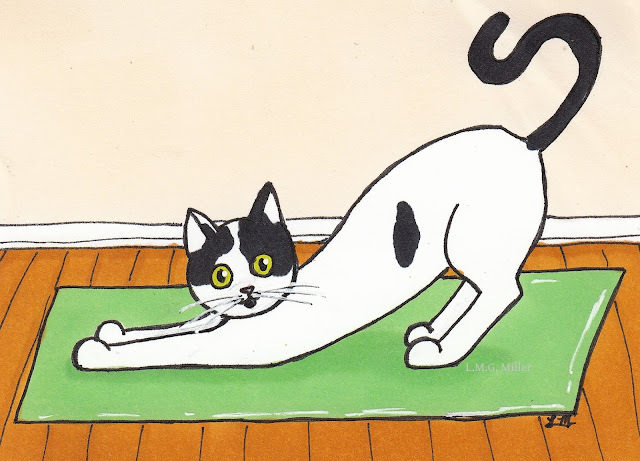 But, then we decided that we didn't want Yang the Yoga Instructor to have to share his doodle with another. 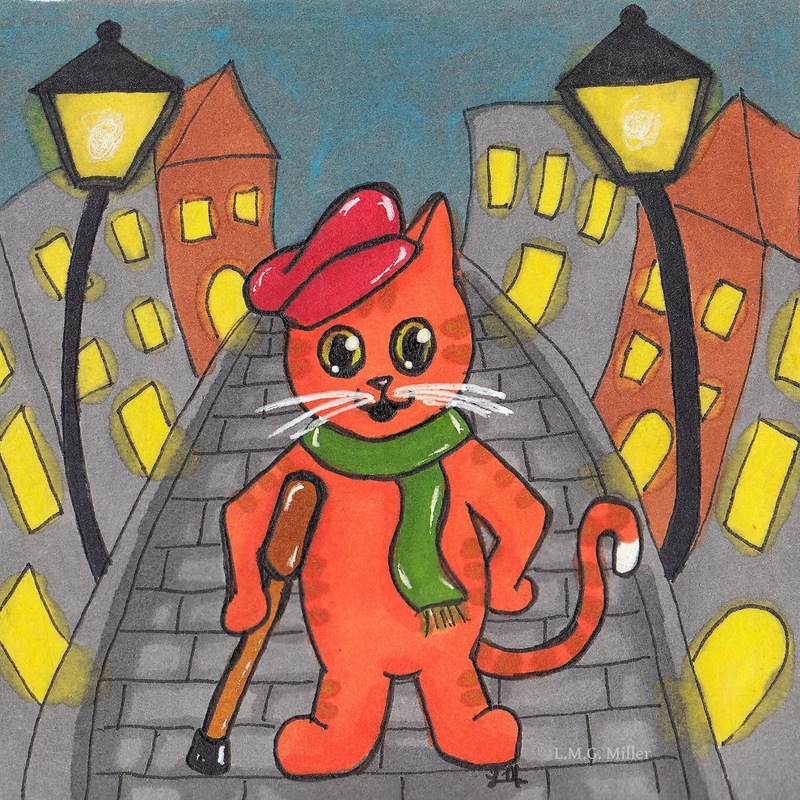 So, stay tuned tomorrow for the next doodle in our Tails of Tiny Tim series! 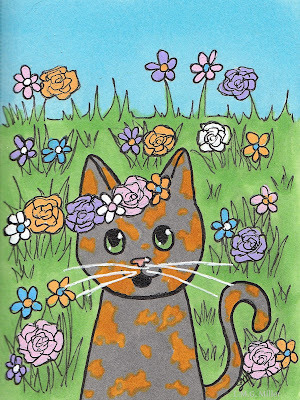 Next up is little lady Thimble, who is taking part in Brian's Thankful Thursday Blog Hop. Thimble is grateful that she recently had a nice window gazing session at the front door. Even if the already filthy window kept fogging up and making visibility questionable, Thimble still enjoyed keeping tabs on her domain. All of us here are also so grateful for all of our blessings. We are thankful to have each other, for our health, for our family, and for all of you wonderful friends. Our last tip for Pet Diabetes Awareness Month is to schedule regular checkups with your veterinarian. Even if your furbaby's diabetes has been under control for a prolonged period of time, or even in a potential case of diabetic remission, it is still wise to schedule regular vet visits. Regardless of how long a cat or dog has been living with diabetes, regular bloodwork and urinalyses, for example, are very important for monitoring their overall health and status. Bloodwork such as frucotsamine checks can help reveal if blood sugar has indeed been staying steady over a longer period of time, as a fructosamine test can indicate the average blood glucose level over the span of the past 2 or 3 weeks. This is beneficial as it gives a broader view of diabetes regulation, far more so than just a single-moment blood glucose check. In addition, regular urinalyses can help check for glucose or ketones in the urine, or for signs of UTI, which are often more common in diabetic cats and dogs. Just as always, it is better to be safe than sorry, so never forget the importance of regular vet visits. We try not to give you all reviews to read two days in a row. But, alas, that is what we are doing this week. So, as part of the Chewy.com Blogger Outreach Program, today Astrid has some thoughts to share on Dr. Tim's™ Natural Beef Chips. Beef hearts are the only ingredient in these treats. They are freeze-dried, and they can be given as treats, or mixed with water for a moist snack. I decided to use them as the former, and offered them to Astrid as a typical treat. Astrid is especially a fan of soft and chewy treats, so I wondered what she would think of these treats that are not necessarily soft, but that are also not hard and crunchy. The answer is, she likes them! Though I failed to get photographic evidence of Astrid snacking on the Dr. Tim's™ beef heart treats, this lady pup really did end up enjoying them. Upon her first taste, I could tell Astrid was investigating the texture as she tossed it around in her mouth. Anything too crunchy usually gets tossed to the floor, but these must have been deemed soft enough to devour, because after a moment, she gobbled it right up, and then three more after that. Yesterday we finished our Ten Days of Tortie series (at least, until we start our next one in a couple of months). We're continuing on with our doodles starring furbabies who we believe too often get pushed to the back burner. So, what furbabies are up next? Those who are specially abled! As the human mom to a hind limb paralyzed kitty, a kitty with a head tilt and facial nerve paralysis, and a now three-toed pup, I love me some specially abled furbabies. Yet, I rarely manage to find goods out there starring specially abled cuties. So, that's why they're next in our lineup. That all being said, because we're just a tad bit strange here, we're not just doodling plain and simple specially abled furbabies. Rather, we're yet again getting festive, and we're channeling A Christmas Carol and calling this series Tails of Tiny Tim. It's still Pet Diabetes Awareness Month, and so we have another tip today for those who might know a diabetic kitty or pup. Yesterday we mentioned the importance of diet for a diabetic furbaby, and today we're mentioning how exercise is also significant for keeping diabetes regulated. Just as with humans, a proper activity level can help to keep diabetes under control, this especially being the case for a diabetic kitty or pup who is overweight and in need of losing weight. That being said, though, exercise and activity level also can affect blood glucose. For this reason, talk to your veterinarian regarding a healthy level of exercise for your diabetic furbaby, and how to best monitor their activity level, weight, and diabetic status. We sure are late in doing this month's reviews as part of the Chewy.com Blogger Outreach Program. You can blame the human. 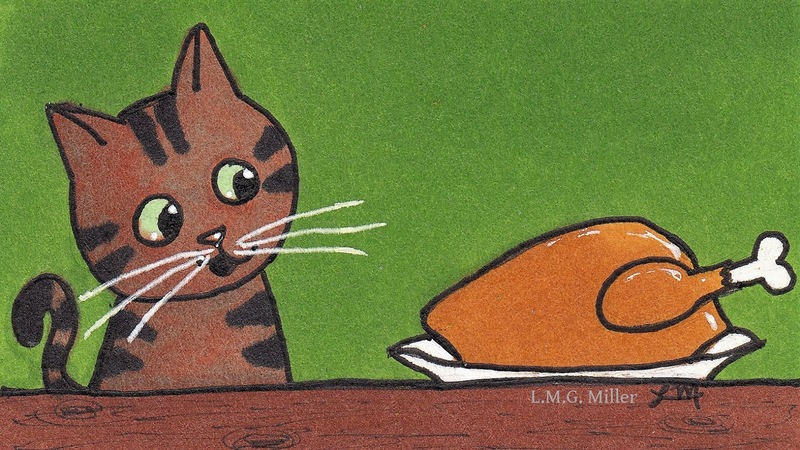 Well, anyway, the finicky felines are here today to let you know what they think of InstinctⓇ grain-free minced chicken recipe in savory gravy. This wet food food is not only grain-free, but also made from real chicken, as well as fruits and vegetables. The kitties around here prefer food of the paté variety. This food does contain morsels, but it also has a decent amount of gravy. I thought that might be in its favor. But, I don't get the final say here. So, I called for the kitties, and they (blurrily) made their way over. Thimble in all of her blurry glory. Blurry Evan. Maybe some day I'll learn how to take proper action shots. It's no surprise that this one's blurry. Eddy is in it, after all. Now, what did the furbabies have to say about the InstinctⓇ chicken food? Toby licked the food, and Eddy even came over for a sniff. Given that Eddy usually gives moist food little to no attention, I thought that was a good sign. But, alas, ultimately none of the kitties around here ate it. Fear not, though. As always, my parents' 11 kitties came to the rescue. They are not picky, unlike my kitties, and they thoroughly enjoyed the InstinctⓇ food. So, the final tally is 0 out of 16 paws up here at our house, and 44 out of 44 paws up at my parents' house. Wishing all of you a tasty Tuesday! Today is the last day of our Ten Days of Tortie series. For this one, we of course went festive again. 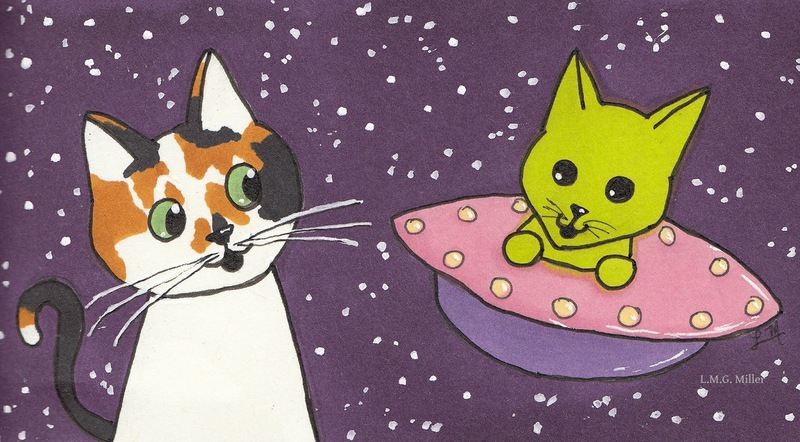 But, we also wanted to yet again create a doodle in honor of the very tortie who inspired this series. So, we channeled the Christmas card we received from lovely Mudpie last year, and doodled up a tortie and her Christmas pudding. Tomorrow we will start a another series of doodles starring certain furbabies who we believe don't get enough publicity. We will continue creating series of doodles in this manner over time. As we mentioned yesterday, we'll even be doing another Ten Days of Tortie series after Christmas. After all, torties more than deserve their time to shine! Today is Mancat Monday, and Evan just wanted to pop in to show you all his handsome mancat whiskers. Evan is quite proud of his whiskers, as they are quite photogenic. Do any of our furiends have photogenic whiskers? We bet you do! P.S. 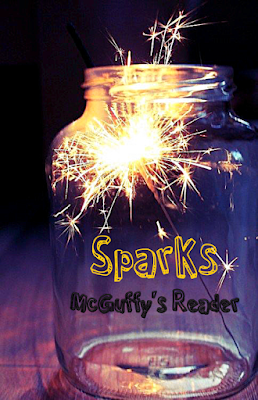 This week we will be participating in the Sparks blog hop, hosted by Annie of McGuffy's Reader, but we will hold off on sharing ours until a tad bit later this week. The reason is that we like to try to match our daily doodles with our Sparks, and we have a doodle coming up later this week that better matches the Sparks we've chosen. 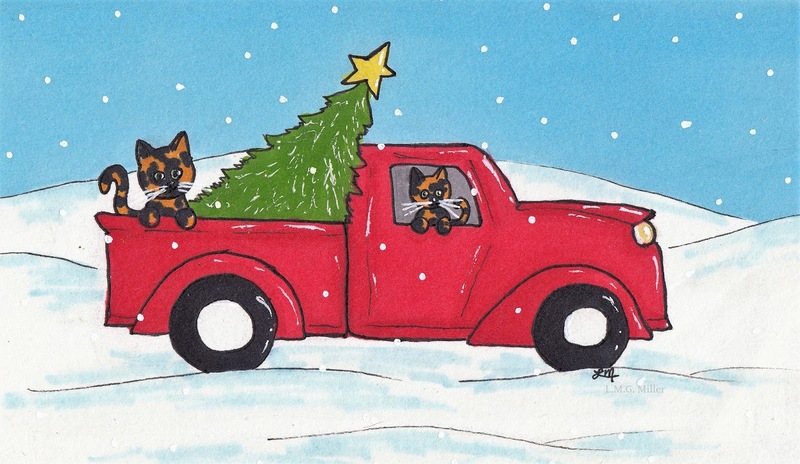 Has anyone else been seeing all of the festive images these days starring red trucks like this one? We have been seeing them all over the place. 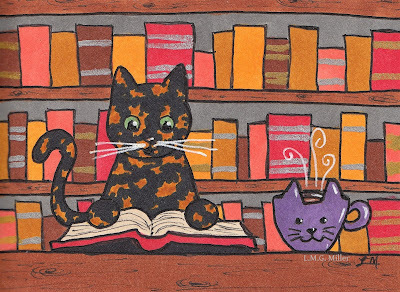 I must admit that I quite like rustic images like that, and so I had to create one myself, only of course starring some torties. Also, we hope you don't mind all of the festive doodles we've been creating. We can feel Christmas in the air already, so you'll probably be seeing lots and lots and lots of Christmas doodles from us these days. That being said, we do plan on doing another Ten Days of Tortie in a couple of months, without the influence of Christmas. Today's Pet Diabetes Awareness Month tip is to know and understand what blood glucose levels mean, especially if you are monitoring a diabetic cat or dog's blood glucose at home. What's more, in case a diabetic furbaby ever has an emergency case of hypoglycemia (low blood sugar), be sure to have honey, maple syrup, corn syrup, or some form of sugar syrup available. Rubbing a sugary substance such as one of these on a hypoglycemic animal's gum line or in their cheeks can help to raise their glucose to a safer level. Of course, discuss with your veterinarian any questions you have regarding hypoglycemia and reversing it. Also be sure to alert your veterinarian of any hypoglycemic events your furbaby has, so that better diabetes management can be achieved. The above being said, also make sure you understand the factors that can affect blood glucose. Food intake, of course, largely affects blood glucose levels. For example, if your furbaby has a decreased appetite and is not eating, administering insulin can potentially lead to hypoglycemia. This is because an animal gets glucose from their food. If your furbaby is not eating and is therefore not taking in food as a source of glucose, then administering insulin, which lowers blood glucose, can lead to even lower levels of glucose. So, be sure to discuss all such factors with your veterinarian, and be sure to hold off on administering insulin if your furbaby is not eating so that hypoglycemia does not result. Hi, friends, it's Eddy here today. I just wanted to pop in and show you a bit of a selfie I very recently snapped. It's a pretty magical one, if you ask me. I'm sorry it's so blurry, you guys. I was just so excited I could hardly contain myself. After my mom ripped apart my tree last winter and then shoved its dismembered body in a box, I thought I'd never see it again. But, she just this weekend pulled its remains from the box and restored it to life. Isn't that wonderful? I snapped even more excited selfies with my faux fir friend, and I'll be sure to share them with you over the next couple of weeks. Don't worry, those are all in my usual blurry style as well. Sitting still is so overrated. 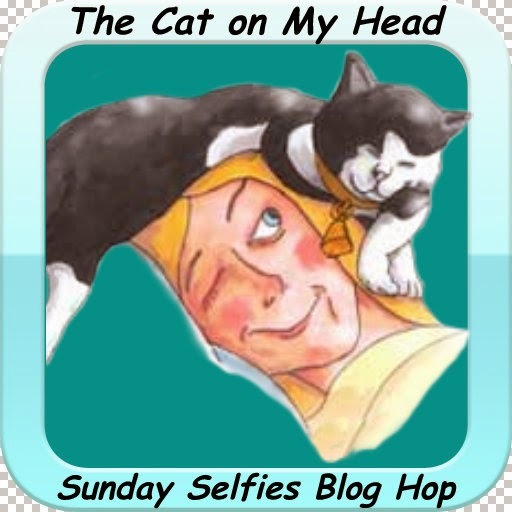 Of course, today's selfie is my entry in the Sunday Selfies blog hop, hosted by our Kitties Blue friends over at The Cat on My Head. Happy Sunday to all of our friends! 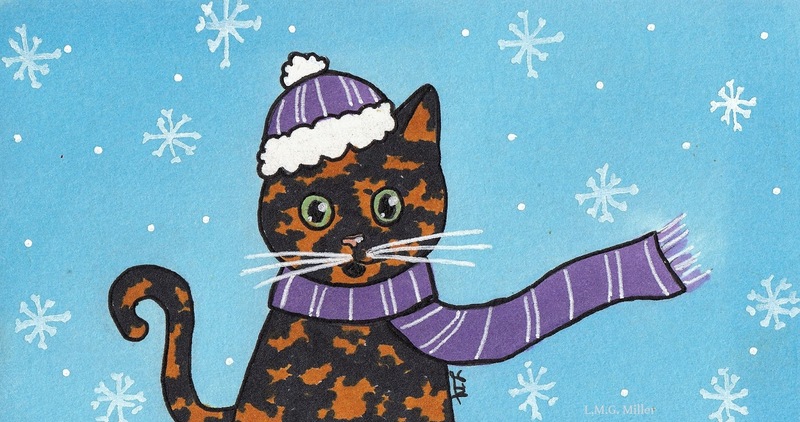 We went for another dilute little tortie doodle today, and mixed it with a little Christmas magic. As we mentioned before, November is Pet Diabetes Awareness Month, and so we're giving some tips related to that significant topic. Today, our tip relates to at-home monitoring of diabetes. Just as with humans, blood glucose can be checked at home for kitties and pups. This is often done using a vein in the ear, a sterile needle, and a glucometer like those used for humans. Of course, this sort of at-home monitoring may not be an option for all furbabies, depending on the owner's comfort with the practice, the kitty or pup's health status, and also on their personal demeanor. But, if your furbaby is diagnosed with diabetes, do consider discussing this potential option with your veterinarian. After all, if you are able to check blood glucose at home, that can allow for closer monitoring of your furbaby's diabetic status. Regardless, though, regular blood glucose checks are important for diabetic furbabies, especially early in the disease. If you are unable to check it at home, discuss with your veterinarian how often your furbaby should be brought in to the vet's office to have their glucose checked. We're feeling pretty festive today. Why? Because, with Thanksgiving said and done, it's all about Christmas these days. Our tree is up, our halls are decked, and the Christmas music is playing nonstop. That all being said, of course we had to go festive for today's doodle. Then again, you'll probably be seeing lots of Christmas doodles from us these days. 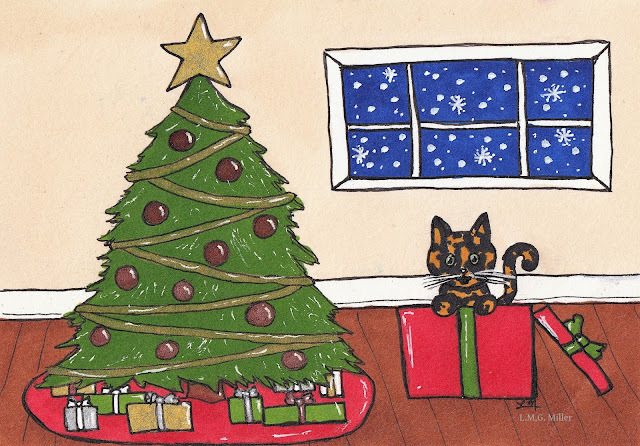 This festive doodle is of course our entry into Athena's Caturday Art blog hop. Who else is feeling festive on this Caturday? 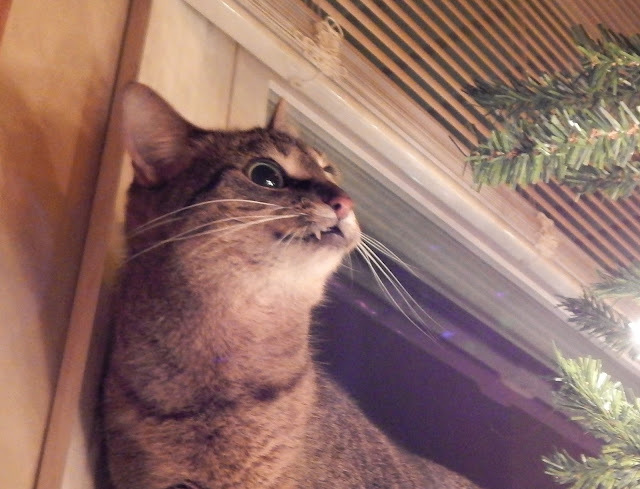 Do you have a Christmas tree? Have you decked the halls? Continuing on with our tips for National Pet Diabetes Awareness Month, today we're here to say that, of course, always give insulin and other treatments as discussed with your veterinarian. The amount, frequency, and timing of insulin administered to a diabetic furbaby is very important for getting blood glucose under control. For this reason, be sure that you understand how to administer the insulin, which is injected beneath the skin, and have your veterinarian give explanations and demonstrations as needed. Also make sure that you understand the proper storage and preparation of insulin. In most cases, insulin needs to be refrigerated, and before administration it is often suggested that the bottle of insulin be rolled between the hands in order to prepare it for administration. Then there is also the important step of pulling up the insulin into the syringe for administration. If you have any questions or concerns with any of these steps, never hesitate to ask your veterinarian. And, of course, immediately let your veterinarian know if you notice any changes in behavior that might indicate that an adjustment to the insulin dosage is needed. Keep a close eye on your diabetic kitty or pup's water intake, eating habits, bathroom habits, activity level, and other such factors, as all of these can be affected by either high or low blood glucose levels. You know your furbaby best and spend the most time with them, so do be sure to keep a close on them and inform your veterinarian of any concerns you have. We hope all of our US friends had a wonderful Thanksgiving! And we of course hope that all of you have had a wonderful week! Now, this week is coming to an end. 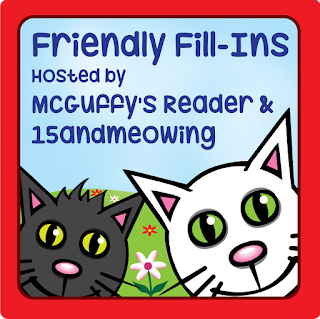 That's okay, though, because that means it's time for the always fun Friendly Fill-Ins challenge, hosted by our friends over at 15andmeowing and McGuffy's Reader. I was again so happy to see such festive fill-ins this week. 1. I start to decorate for Christmas/Hanukkah _________. 2. I prefer a _________ Christmas tree because _________. 3. The best thing about the holidays is _________. 4. The worst thing about the holidays is _________. I hope my answers are even half as festive. 1. I start to decorate for Christmas on Black Friday. 2. I prefer an artificial Christmas tree because I can't keep a plant alive to save my life. 3. The best thing about the holidays is the magic of the season. 4. The worst thing about the holidays is the state of my kitchen. Okay, now, are you ready for your weekly Eddy fix? Eddy still loves her Jackson Galaxy Space Station that we won from the Kitties Blue! She had been playing with it before this shot was taken. That is, right up until she saw that I had the camera. I guess you could say Eddy is a bit camera shy. Do any of our tortie furiends out there love a good box? November is National Pet Diabetes Awareness Month. So, for the rest of the month, we'll be giving tips related to this disease. To begin, we'll start with a tip that you all certainly already know. And that is, to be very vigilant with regard to your furbaby's behaviors and body, keeping an eye out for signs of diabetes, and of course for signs of any disease. How often is your kitty or pup drinking? How often are they urinating? What is the volume of their urine? The color of it? Has their appetite increased? Has it decreased? Does their fur look dry and dull? Are they more lethargic than usual? Have any of these things changed recently? How recently? These are just some of the questions that, as a pet parent, you have to ask yourself every day. Regularly observe and check your kitty or pup for any changes in their body or behaviors, and if you have any concerns, whether your furbaby has or has not yet been diagnosed with diabetes or any other disease, consult your veterinarian. As always, early detection and beginning treatment as early as possible can be crucial. Today and every day, we are so very thankful for our health and home. We are thankful for the pie on our plates, and for all of the food in our stomachs. and for the wonderful friends we have in all of you. 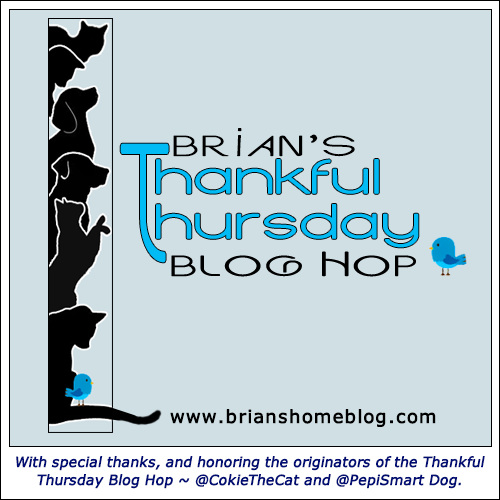 We are, of course, entering all of these blessings into Brian's Thankful Thursday Blog Hop. Now, we didn't forget that today is also the Thoroughly Poetic Thursday challenge, which is hosted by handsome Angel Sammy and Teddy. This week, we've made it all the way to the letter X. That sure is a tough one, isn't it? We had a suggestion from a certain kitty's mom, though, and that very kitty is the one who stars in our poem today! Oh me oh my, what does that say? Speaking Greek is not my forte. A little translation will make things much clearer. Yes, that's better, you can call her Chimera. So then, have you met Chimera? She is the Xenobiologist of the era. But most especially those from outer space. And even all the way to Neptrune! And she especially longs to meet those who hail from Mars. As she recently had a grand breakthrough. And now Chimera the Xenobiologist knows that extraterrestrial life is no lie! Since it's the big day itself, today is our last day of Thanksgiving tips, and we're going to sound like a broken record. As we have mentioned on many other holidays and other days of the year, please be sure to ensure your furbaby's safety if you have visitors or if foot traffic increases at your home on Thanksgiving. Especially for indoor furbabies, reduce or prohibit their access to the door, so that they can't slip outside when Thanksgiving visitors arrive. If you are worried that your kitty or pup might get underfoot and thereby put themselves at risk, perhaps consider setting them up in a safe room all to themselves. This could also reduce the risk of them being fed or stealing dangerous foods during Thanksgiving meals. Also try to ensure that your furbaby has identification, such as in the form of an ID tag and/or microchip, in the case that they might escape. After all, as if we haven't said it before, it's always better to be safe than sorry! Calista Jo was hoping for some dilute torties during this series! Now, how many torties out there are the boss of their domain? Adding to our Thanksgiving kitchen tips, don't forget to take out the trash! There are a number of reasons to make sure your furbaby does not have access to the trash, turkey bones being just one of them. 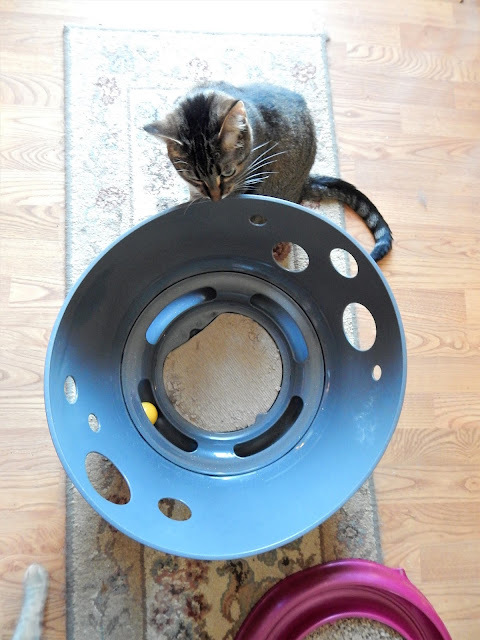 Bones, scraps of toxic foods, food wrappers that could cause bowel obstruction, and a number of other potential dangers could arise from keeping the trash bin where your furbaby can reach it. This is why, on Thanksgiving or any day of the year, try your best to block your kitty or pup's access to the trash, or take it out as often as possible. First up, we want to apologize for being late to post and being absent from some of your blogs lately. Our internet at home has been acting up for a while, and this weekend it finally went kaput. Let's be honest, the internet was working, albeit slowly. Then I decided to unplug the modem and see what I could do, and thereafter it didn't work at all. I guess I don't have the magic touch. What's more, I couldn't do much blogging even using the data on my phone either. Why? Because I dropped my phone in a parking lot on the same day the internet went out. My phone's screen shattered and it hasn't worked the same since. You guys, around here, the furbabies aren't the reason we can't have nice things. I am. Now, moving on. Our housemate Toby wanted this to be a Tuxie sort of Tuesday. So, he snapped some shots of himself to show you all. Toby apologizes for not looking at the camera. He was a tad bit busy spying on the neighbors. Now, though it's a day late, we finally have our contribution for the wonderful Sparks blog hop. This blop hop for positivity is hosted by Annie of McGuffy's Reader. Many of you have probably noticed that our tips lately have been all about Thanksgiving foods, and which ones may or may not be safe to offer as a treat to your furbaby. In line with that, keep in mind all of the potential dangers the kitchen can offer when you're cooking up a storm. Hot ovens and stove tops, knives, and of course those hazardous foods being prepared are just some of the potential dangers for a furbaby hanging around the kitchen. Especially if your furbaby might be one to show too much interest in the hot oven or dangerous foods, do consider taking precautions and blocking them out of the kitchen as you prep for the holiday. You can keep your kitty or pup in a safe room, or even use a baby gate to block them from the dangers of the kitchen. Though it might seem sad to block your furbaby from you, if it is for their own safety, it might very well be the best option. Thanksgiving may be this Thursday here in the United States, but it already feels like Christmas sort of weather here in our part of the world. It's been cold and wet, with rain and even some snow flurries. Evan and the other kitties around here don't mind one bit, though, because they stay inside where it's warm, where there are blankets and laps to keep them cozy. Or, sometimes it's even fun to just gaze out the window and watch the rain and snowflakes fall. The view would be even better if it looked a little like this, don't you think? That is indeed our second installment in the Ten Days of Tortie series. We have more of these lovely lady cats in store for you, and we hope you enjoy them! 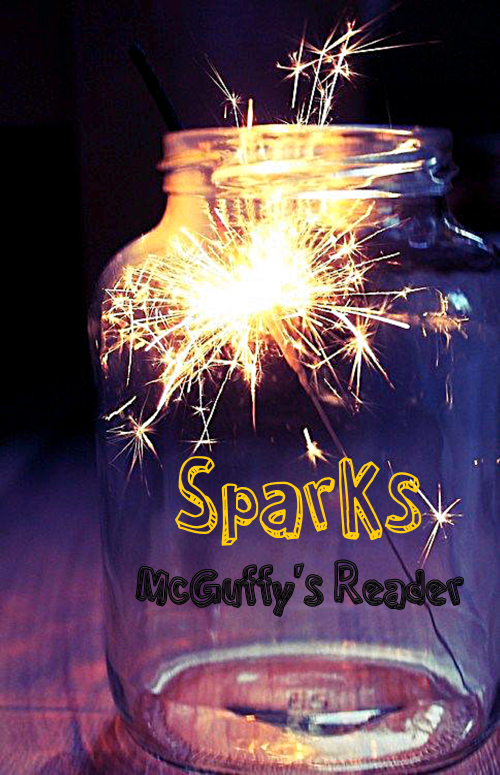 Now, we usually participate in the wonderful Sparks blog hop, hosted by Annie of McGuffy's Reader. But, this week we're going to have to postpone or contribution. Why? Because our internet went out this weekend. The human here had to run to her parents' house to quickly mooch off of their internet in order to complete this post. We failed to select a quote for our Sparks earlier, and we don't want to rush it now. We'll post our Sparks within the next couple of days, though! We wish you all a magnificent Monday! We've been talking about what foods on the Thanksgiving dinner table may or may not be healthy for your furbaby to taste. Today, we'll switch it up a bit and talk about food more geared toward our kitties or pups. If you would like your furbaby to be able to enjoy their own little Thanksgiving goodies that are more assuredly safe for them, then consider selecting dog or cat treats in festive flavors. For example, grab some moist food or treats in flavors such as turkey or pumpkin. In addition, you might be able to find specially made Thanksgiving treats, such as dog cookies in the shape of traditional Thanksgiving foods. Just the other day we saw on none other than Etsy some dog treats that are safe yet are shaped and decorated like turkey drumsticks, mashed potatoes with butter on top, noodles, and other such Thanksgiving goodies. Some pet stores might sell treats such as these as well. 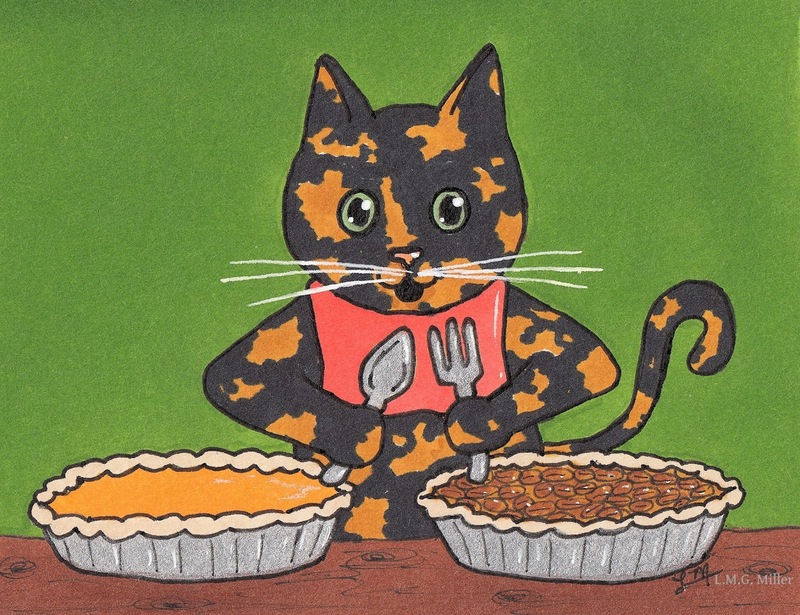 Or, you can try your hand at making your own Thanksgiving treats for your kitty or pup, just as long as you are certain the ingredients are safe. Of course, still feed any such treats in moderation! Can you guess who snapped a selfie for today? Huh? Can you? 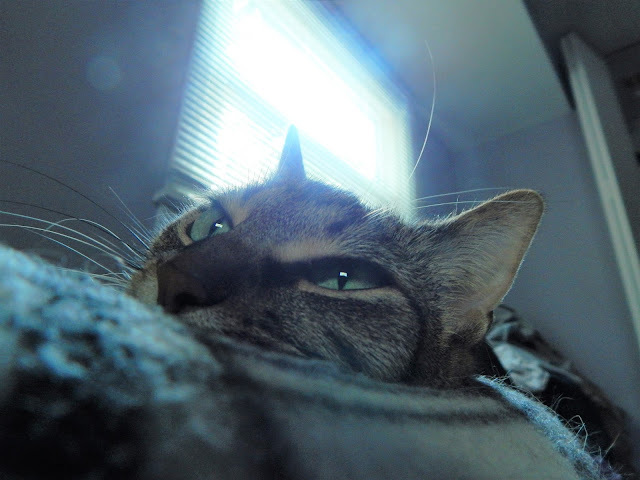 Pup Astrid, that's who snapped our selfie for the Kitties' Blue Sunday Selfie blog hop! We're guessing that selfie of Astrid's looks pretty familiar. Astrid has something like two poses she'll strike on a regular basis. I promise all of her pictures are always new and fresh shots, she just always looks the same in just about all of them. What's more, we have one final update on the malignant sarcoma Astrid had removed by way of a toe amputation. On Friday, Astrid had a date with her doctor, because they wanted to do one final check of the incision. Well, the doctor said it looks great, and Astrid has been given the okay to go back to her usual ways! That means regular walks again, and no more of those quick little trips around the block that give the poor girl cabin fever. Needless to say, we're all quite happy! 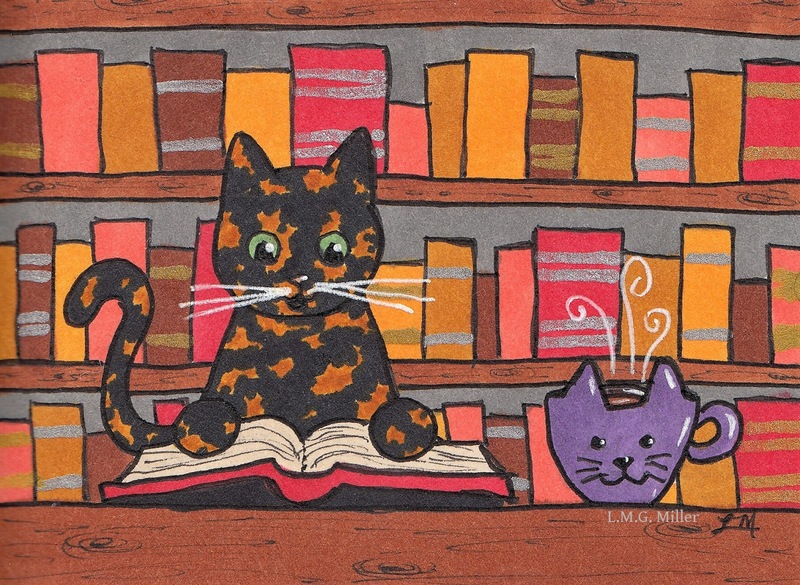 Now, all of that being said, it's time for our first doodle in our Ten Days of Tortie series. 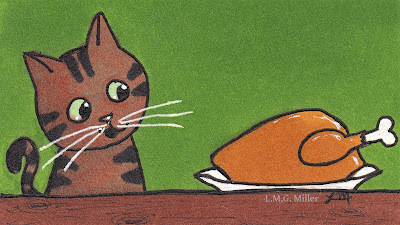 These doodles were inspired by Mudpie and her mom Melissa, who got us thinking upon recently mentioning that finding goodies starring adorable torties is not all that easy of a task. So, we've decided to give some love to terrific torties by creating ten days of doodles just for them. 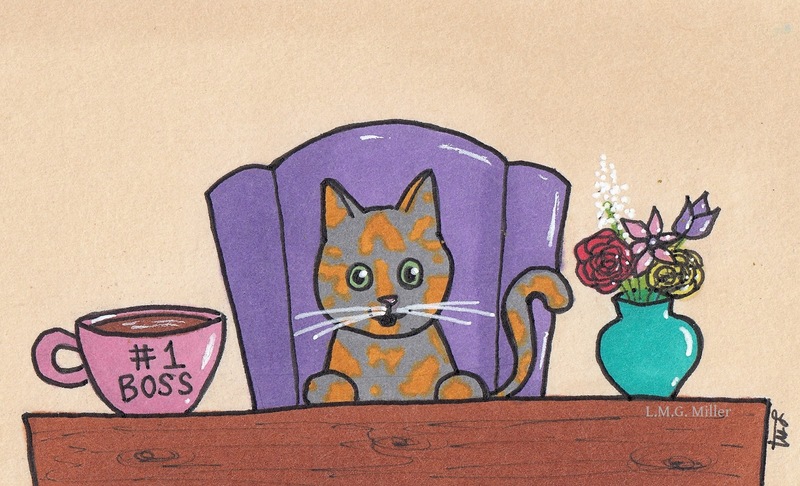 The first doodle in our Ten Days of Tortie is for lovely Mudpie herself. I'm sure most of us know that she and her mom are quite well-read, and of course fancy a cup of joe. So, this one's for you, Mudpie! Another common Thanksgiving food we haven't mentioned yet is stuffing. Is this Thanksgiving staple safe for your furbaby? More than likely, it is best that you simply avoid feeding any of that stuffing to your kitty or pup. Why? Because many stuffings include ingredients such as onion, garlic, plenty of butter, or others that could cause ill side effects. If the stuffing is plain, without any potentially dangerous ingredients, then a small taste might be fine for your furbaby. But, more than likely, that stuffing will contain some ingredients that simply should not be part of your cat or dog's diet. We mentioned last week that we were thinking of doing some sort of snowkitty and cat-o'-lantern mashup. 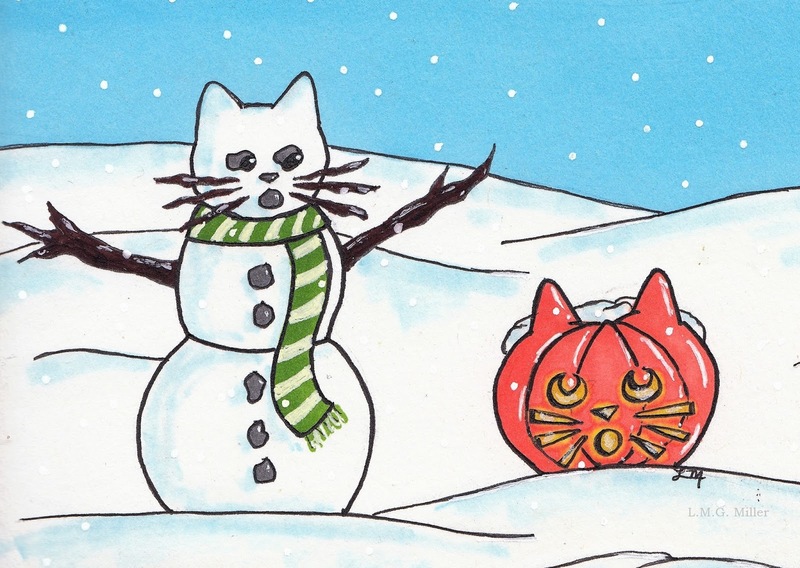 So, we plopped a cat-o'-lantern into a winter wonderland, and now neither it nor the snowkitty know what to think. Then again, neither do we. 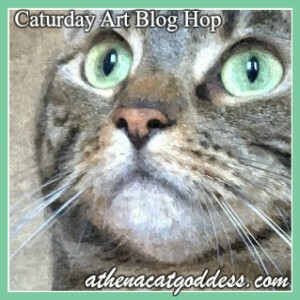 This Caturday confusion is our contribution to Athena's Caturday Art blog hop. Now, speaking of art, starting tomorrow, we're going to embark on a new series of doodles. We would like to start bringing some artsy fartsy attention to furbabies who don't seem to get as much publicity as they deserve. 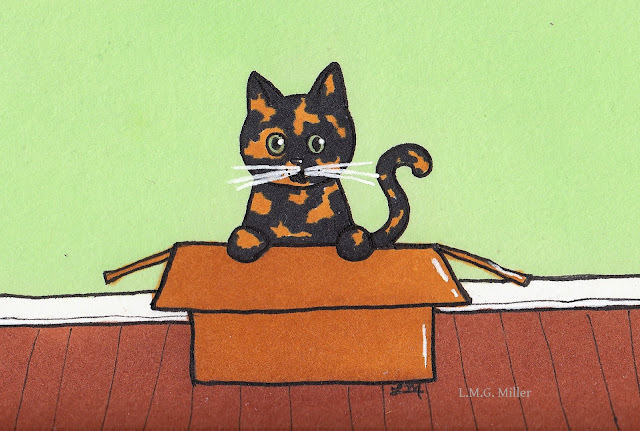 One of the things that prompted this for us is something lovely Mudpie's mom Melissa mentioned about the difficulty of trying to find items that star torties. When you see cute kitty items at the store, how often do you see a tortie in the mix? Not often, if you ask us. So, that got us thinking. We started making a list of all types of furbabies who tend to get pushed to the back burner. We have a number of ideas on what forgotten furbabies we could doodle for this series, but do feel free to leave suggestions in the comments! We will kick off this series tomorrow with Ten Days of Tortie. Do you know what holiday food we haven't mentioned yet? Cranberries! This here human loves cranberries, but are they safe for our kitties and pups? In moderation, plain cranberries can be given as a small treat to a dog or cat who enjoys them. That being said, steer clear of cranberry sauces and juices, as those contain excess amounts of sugar and other potential additives that might not be the best for your furbaby. Also be careful with special cranberry dishes, in case they contain not only excess sugar but potentially also toxic ingredients such as alcohol. As always, when in doubt, simply don't offer it to your furbaby. We'll start today as we always do, and that's with the fun Friendly Fill-Ins, hosted by our wonderful friends over at 15andmeowing and McGuffy's Reader.. I always enjoy the fill-ins. But, I get especially excited when they're extra festive, like today! 1. I can't wait to eat _________ on Thanksgiving. 2. My favorite kind of pie is _________. 3. This year, I am particularly thankful for _________. 4. A funny holiday tradition in my/our house is _________. 1. I can't wait to eat turkey on Thanksgiving. 2. My favorite kind of pie is pumpkin. 3. This year, I am particularly thankful for the health of my furbabies, especially pup Astrid. 4. A funny holiday tradition in my/our house is hiding a creepy clown ornament for someone else to find. Many of you probably know what's up next. As always, it's Eddy's turn to star on Friday! That sure isn't an award winning shot. But, when you catch Eddy snoozing and sitting still, you simply sneak up and do what you can. Happy Friday to all of our friends! Even fruits might come in to play at the Thanksgiving table. So, which fruits are safe to offer as a small treat for your furbaby? If fed in moderation, berries such as blueberries and strawberries are healthy for cats and dogs, as are bananas, and also apples as long as you don't feed your furbaby the seeds. That being said, keep in mind that when fruits like apples are made into pies, added ingredients such as sugar are not so healthy for your furbaby. Of course, also remember that fruits like grapes and raisins are toxic to cats and dogs, so never feed those. Even cherries are dangerous, especially if consumed in large quantities, as cyanide poisoning can result due to the contents of the seeds, stem, and even leaves. 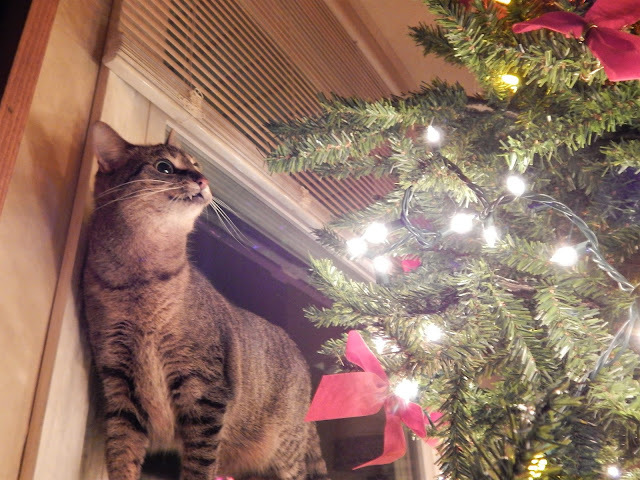 So, among other potentially dangerous foods, don't feed your furbaby cherries, cherry pie, and most certainly not chocolate covered cherries this holiday season. Who here is ready for Thanksgiving? Are you excited for some turkey? After all, Turkey Day is just one week away! For today, though, things are as normal. 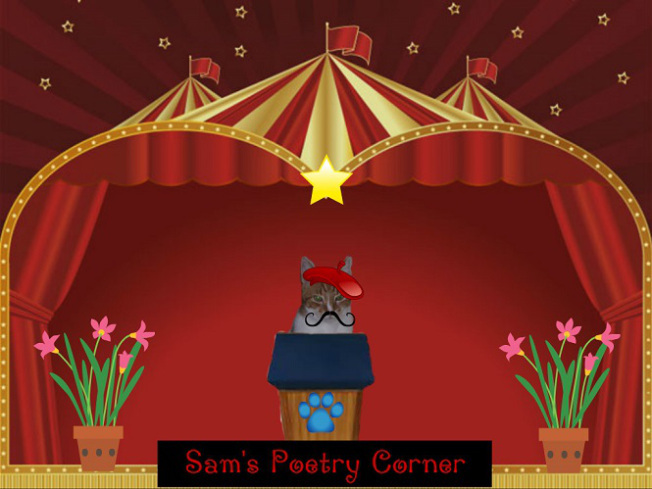 That means today we have a poem to share with you as part of Angel Sammy and Teddy's Thoroughly Poetic Thursday challenge. This week, we've reached the letter W. If you've been following our poems throughout this challenge, you might have an idea of what we have in store. Is it sunny and fair? Or is it snowing enough to suit a polar bear? Just tune in to Wally's weather show. Or whether a snowstorm might delay your train. Wally can tell you the weather for this afternoon. He will know if your evening picnic might be ruined by a typhoon. And will tell you if your weekend plans the weather will butcher. Wally the Weatherman is your guy. After all, he knows all that goes on in those clouds in the sky. Now, of course, it is Thimble's turn to star in this Thursday post. Thimble was all set up for a photo shoot recently, but she ended up having competition. Do you see that? Thimble's silly human of a mom put a scarecrow in Thimble's modeling station. What's up with that? Don't worry, though, Thimble took care of it. Thimble is entering her happy freedom from that scarecrow into Brian's Thankful Thursday Blog Hop. Moreover, we are grateful for all of our blessings. We are thankful for the upcoming Thanksgiving holiday, when we can celebrate all for which we are grateful. We are thankful for our family, and for the wonderful friends we have in all of you. As we approach Thanksgiving, for the past couple of days we have been discussing vegetables and which of those at Thanksgiving dinner are and are not healthy to feed your furbaby. One we have not mentioned yet is corn. There is some debate out there on corn, and whether or not it provides much beneficial nutrition for cats and dogs. While corn in small amounts may not cause much or any harm to your furbaby, it is also believed that corn is not the best type of food for your furbaby to consume. Many studies have determined that corn is not a great source of energy for furbabies, and does not offer all that many nutritional benefits. It is often used in pet foods since it is a generally cheap grain, but at the same time, corn can contribute to food allergies in cats and dogs. That all being said, as long as your furbaby is not allergic, a small amount of corn will not necessarily harm your pup or kitty. But, of course, do try to hold off on allowing your kitty or pup to chow down on a substantial amount of this debated vegetable.